Le Bristol Paris sits within the heart of the city on the rue du Faubourg Saint Honoré, christened one of the most fashionable streets in the world. Much like its location, the hotel reflects a chic, stylish atmosphere for guests to find true pleasure and joie de vivre in spa-ing, relaxing and dining. At the center of the luxury hotel, a member of the elite Leading Hotels of the World collection, is a majestic, manicured garden courtyard. The beautiful Spa Le Bristol by La Prairie, with its spacious wet treatment area and pool deck overlooking Paris, also provides a tranquil corner of the hotel. Dining is another highlight, with a three Michelin-star gourmet restaurant. Spafinder Gift Card can only be redeemed against treatments at the Spa and can not be redeemed against the residential stay. 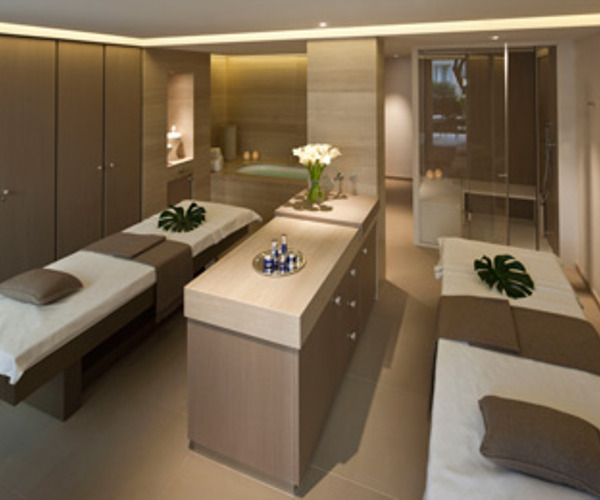 Making its debut in October 2011, the three-story Spa Le Bristol by La Prairie aims to redefine the art de vivre of Le Bristol and French luxury. A menu emphasizing La Prairie skincare and massage treatments and fine appointments including a “Russian Room,” or wet treatment area outfitted with a Vichy shower, marble-heated table, infrared sauna and private steam room, foster a classic, polished feel to the 1,000-square-meter spa. Three of eight treatment rooms offer private terraces overlooking the garden, and there are two couple’s suites, one of which has a steam room and whirlpool. Beauty treatments can be taken in the full-service salon, while in the 40-square-meter fitness center, exercise enthusiasts can maintain their workout routine with personalized programs designed by on-site trainers. The swimming pool area, a masterpiece of teak and glass, opens to an expansive deck overlooking the city. While the grownups spa, the little ones (ages 4 through 12) can play in the spa’s Kids Club area. Le Bristol Paris is located on the famed rue du Faubourg Saint Honoré, lined with art galleries and designer shops, including Lanvin and Hermès, for guests to spend the day browsing. The hotel’s ideal location allows travelers access to beloved sites like the Champs-Elysées, the Place de la Concorde and the Louvre and Orsay museums, also just a short stroll away. The Grand Palais, a historic landmark, exhibition hall and museum at the Champs- Elysées in the 8th arondissment and the Tuileries Garden, in the first arondissment, are must-see attractions for first-time visitors to the “city of light” as well. Le Bristol Paris has 188 guest rooms and suites, some with balconies or terraces, offer sophisticated decadence, designed with such elements as Louis XV- and Louis XVI-style furnishings, antique mirrors, French paintings and rich color palettes. Carrera marble bathrooms add to the chic accents in each room. 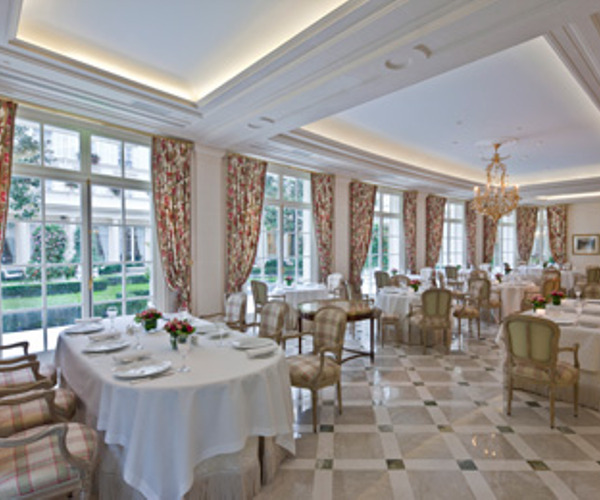 Epicureans can dine on authentic French fare prepared with local produce at the elegant Epicure, the hotel’s three Michelin-Star restaurant. Gold-framed paintings and sconces and patterned drapes thoughtfully contrast with stark white interiors, and natural light streams though floor-to-ceiling windows that overlook views of the garden and magnolia trees. Portion-controlled dishes are available at the spa, and French fare at the inviting Le 114 Faubourg brasserie will also satisfy appetites. The hotel bar is a fashionable escape; by day, it serves a refined afternoon tea service, while by night, the atmosphere transforms into a vibrant hot spot for cocktails and nightcaps.